Larson Electronics 50 Foot Long Explosion Proof Extension Cord with Four Explosion Proof Receptacles. Class 1 Division 1 and Class 2 Division 1 Approved. The Larson Electronics EPEXC-4X-12.3-50-2P3W Explosion Proof extension cord allows operators to safely extend the range of their explosion proof light or equipment cords beyond the boundaries of the hazardous work area. These units are constructed of 50 feet of 12/3 SOOW explosion proof cord and are rated at 20 amps of continuous service. The cord is chemical and abrasion resistant and comes with four inline, 20 amp, explosion proof receptacles installed on one end and a 30 amp rated 2-pole 3-wire explosion proof pin and sleeve style plug installed on the other end. 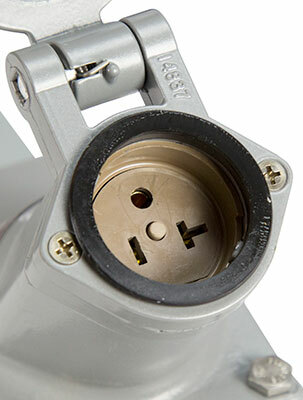 This unit enables multiple connections from a single power source. Each receptacle`s contacts are deep recessed to avoid accidental contact and will accept standard non explosion proof plugs that are NEMA 5-20R, or 6-20R compatible although explosion proof plugs must be used to preserve explosion proof approval in hazardous environments. Ordinary location plugs will NOT activate this cord`s explosion proof receptacles. Inter-Compatibility: These cords use T style plugs and will work with non-explosion proof standard receptacles and plugs (NEMA 5-15R, 5-20R, or 6-20R) but will not work with standard 120V wall outlets. The included plugs and receptacles are cross-interchangeable with Crouse Hind™ part# ENP5201 plugs and receptacles and Hubble-Killiark part# UGP-20231 ACCEPTOR® plugs and receptacles. Any equipment requiring these C-H or H-B plugs should work with these cords. Due to possible manufacturer changes we cannot guarantee interchangability although we have made every effort to ensure cross compatibility correctness.